Just completed a big freelance project – drawing on the computer for seven straight weeks. As a reward to myself, (and as a field test for my Sketching-in-Barcelona hot weather gear) I took the entire day off to enjoy Tuesday’s 26 degrees. I can report – Sun Sleeves by Pearl Izumi really work. And I’m remembering how to paint in direct sunlight. Its amazing how we went from watercolor-will-not-dry to watercolor-dries-instantly in only a week. I’m not in any way complaining. It’s awesome that plein air season is here! These are all in and around the Old Port of Montreal. (Place d’Youville, Place des Armes, Place Jacques-Cartier). All places we might visit in our August workshop. It’s great to see you painting again! Marc … very atmospheric … I like the inclusion of the horse and the man with great pose (did they appear at the end of painting or they were there all the time?). 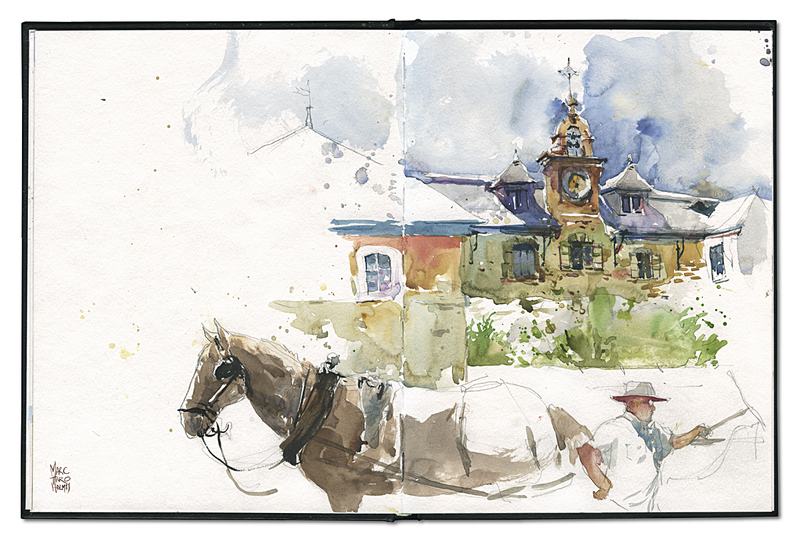 Personally the open window in the last sketch is very special – it just adds another dimension to your sketch… And I love you palette – would you be able to tell me what paint colours are in your palette? Great paintings. I love the way you show detail. How big is the pad you are using? 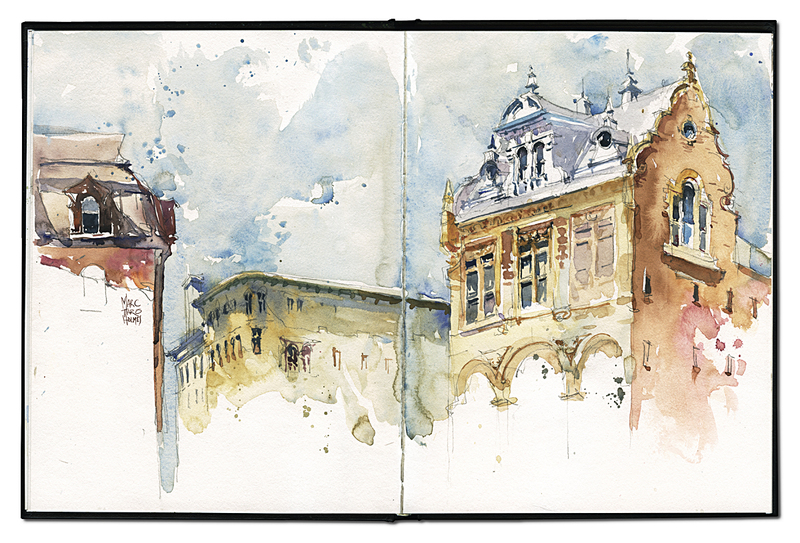 This is one of the Stillman and Birn hardcover watercolor books – so they’re approximately 9×11″ closed, and of course, these are sketched over the fold – 2 page spread. How is that you can see all these colors there? I see only gray :))) Great series! So nice, Marc. Looks warmer that that day last October when you, Shari and I sat on the steps sketching. These are lovely. Enjoy Barcelona, I wish I could attend. 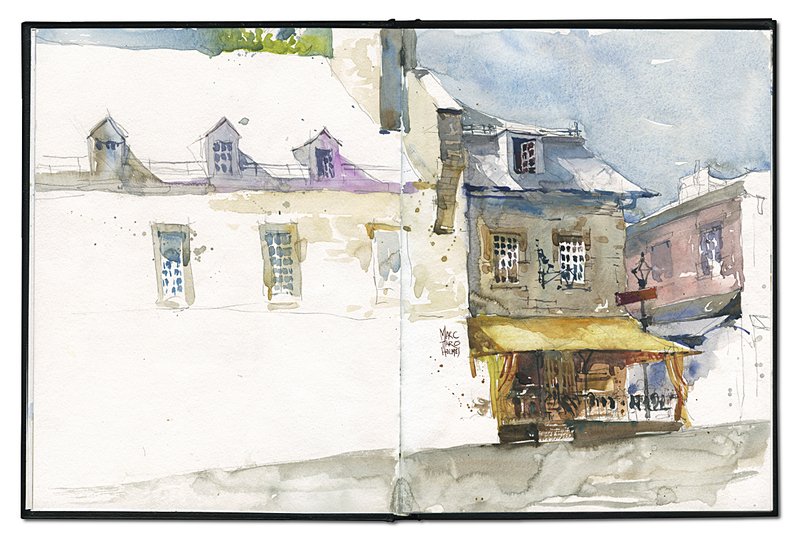 Great to see you painting plein air again, Marc. I look forward to seeing more. Cheers! I love the loose, sketchy, painterly feel on these, even as they capture the architectural accuracy at the same time. And I hear you on needing a traditional break after too much digital; I’m a production artist for medical and scientific material, so I use my lunchtime sketching for daily artistic therapy.